Dramatic footage has captured the moment Lithuanian politician Arturas Zuokas 'lost the plot' and drove an armoured tank over a luxury Mercedes Benz parked in a cycle lane. 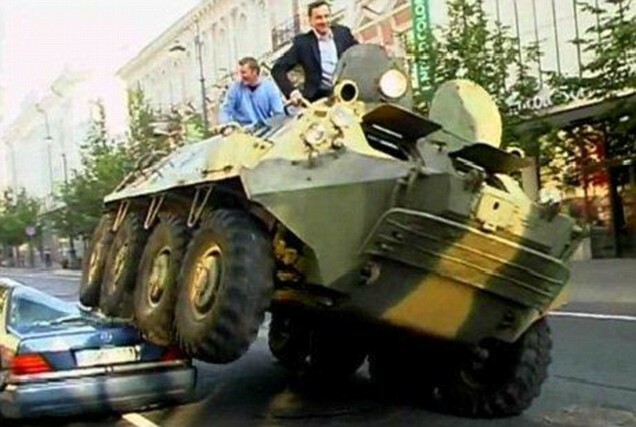 In the country's capital city Vilnius, Mayor Zuokas hopped into the military machine with his cronies and took out his anger on a blue Merc parked on the side of the road. Every moment of this 'terrifying' ordeal was captured on film and as the tanks gigantic wheels crushed the roof off the car like a twig, a wry smile crept across Mr Zuokas' the face. Ok, so dressed in a sharp suit, the 43-year-old didn't really fit the bill of 'crazed mayor' but nonetheless he proved a point - albeit in a rather violent way - to drivers of luxury cars who park illegally on the streets of Vilnius. The stunt was set up by frustrated members of the mayor's office after they received hundreds of complaints, especially from cyclists, saying that parked cars have been blocking their bike lanes. The money shot moment is when the 'owner' of the car dressed in a pimp-esque white blazer and gold chain comes out and confronts Mayor Zuokas, with... wait for it... a friendly handshake. Let's just hope London mayor Boris Johnson doesn't start taking inspiration from Lithuania, although (worryingly) you can definitely see if happening.